If you aren’t familiar with Sam Buttery, you will be soon enough. 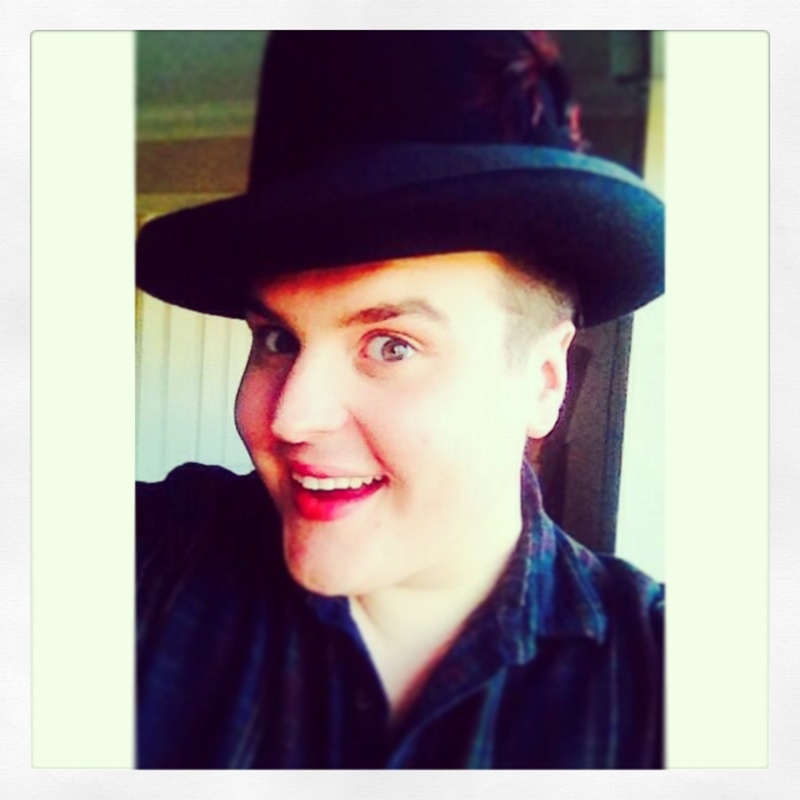 He is an incredibly talented singer and actor from London who among many accomplishments played the legendary Leigh Bowery in the the musical Taboo, which chronicles the London club scene of the 70’s and 80’s and is written by the incomparable Boy George. With talk of Taboo returning to Broadway I for one am hoping to see more of Sam on our shores. Oh, did I mention he is wearing one of my hats? What an honor!! 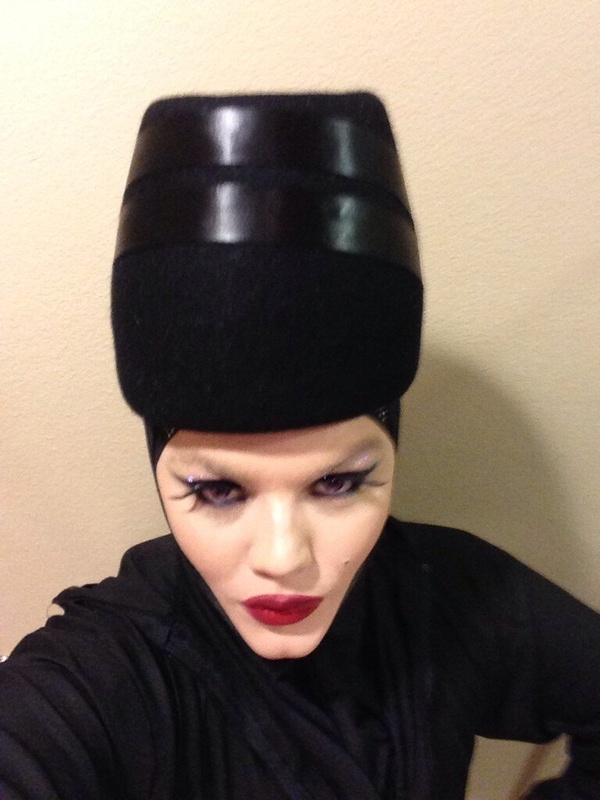 If you don’t know who Daniel Lismore is, I suggest you check him out on Twitter, @daniellismore. He is a brilliant artist and creative director of London based fashion label Sorapol. They are simply masters of detail and purveyors of fantasy. I am so humbled to have a hat of mine on Daniel. 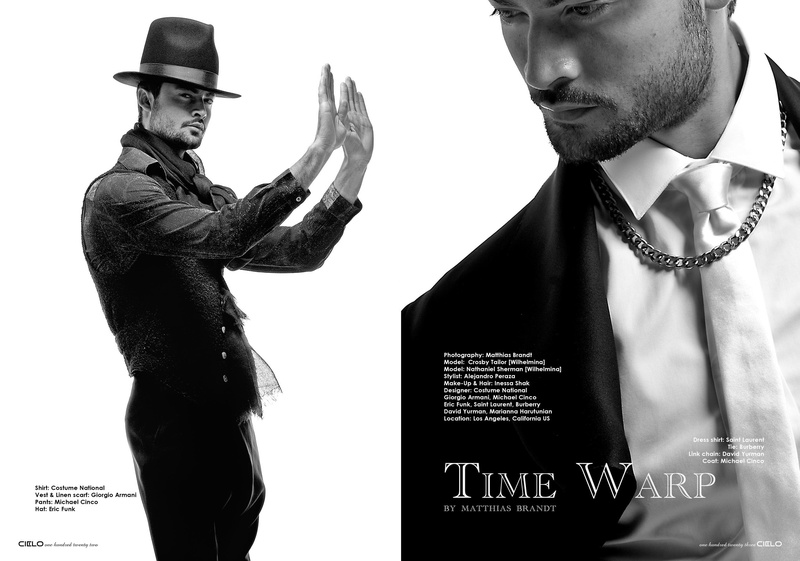 Some great images from Matthias Brandt (matthiasbrandtphotography.com) styled by Alejandro Peraza featuring some great fashion and some of my men’s hats. 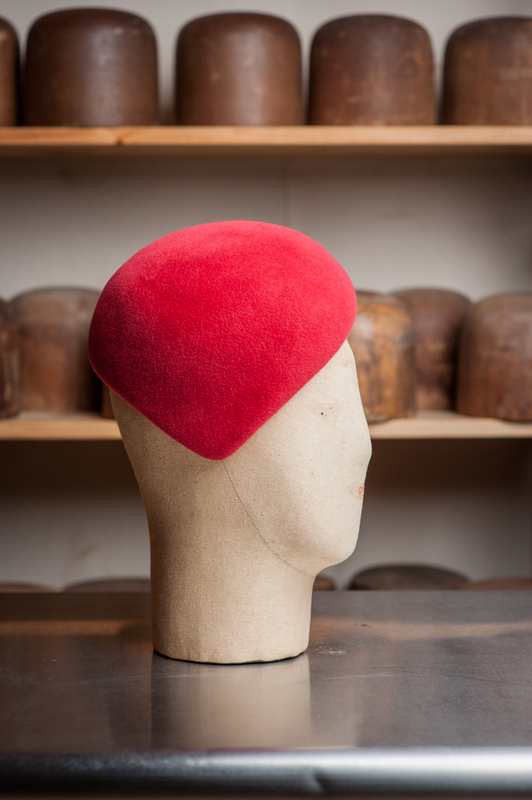 I hope you enjoy my complete line of hats for Fall/Winter! Men’s shape with vintage ribbon and hand curled trim. Top Hat with vintage abalone buckle and feather trim. 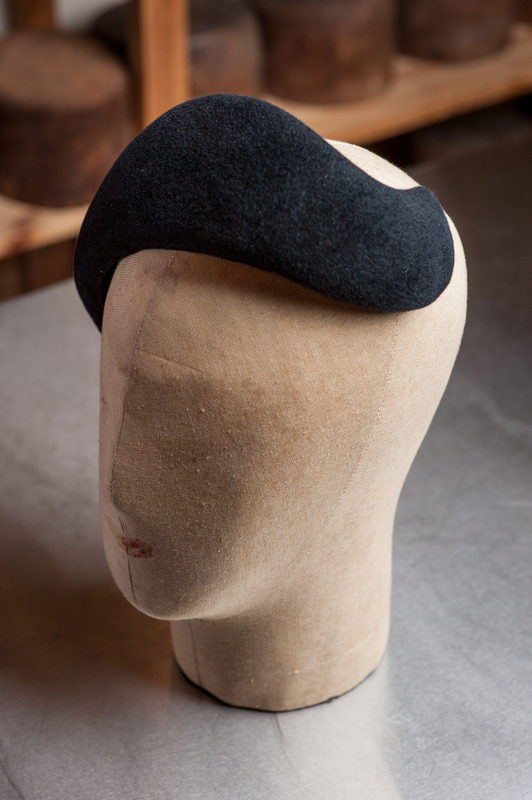 Groovy Black Visor in beaver style felt with buckle trim. Groovy Visor in alabaster beaver style felt. May be worn as shown or hand shaped to suit. Hippie Chic Wide Brimmed Floppy in silver beaver style felt with silver hand knotted double helix band. Rear view with knotted detail. 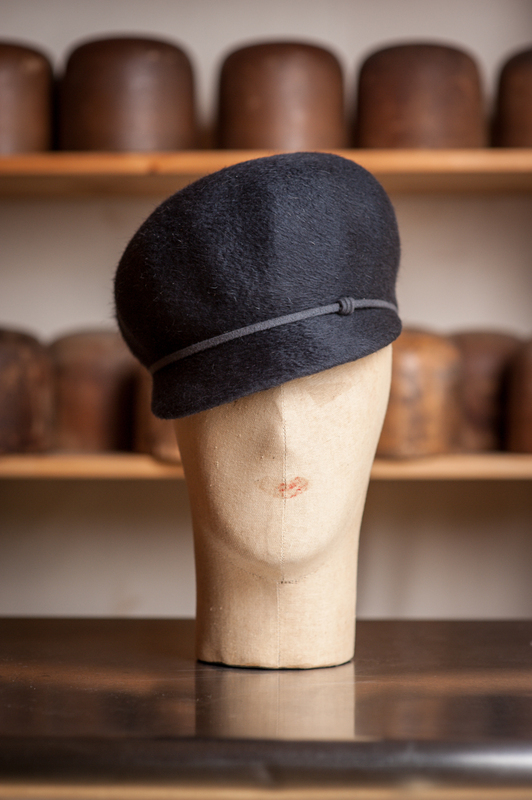 Hippie Chic Wide Brimmed Floppy with in black beaver style felt with gold hand knotted double helix band. Groovy Visor in gray velour style felt with band and ring trim. 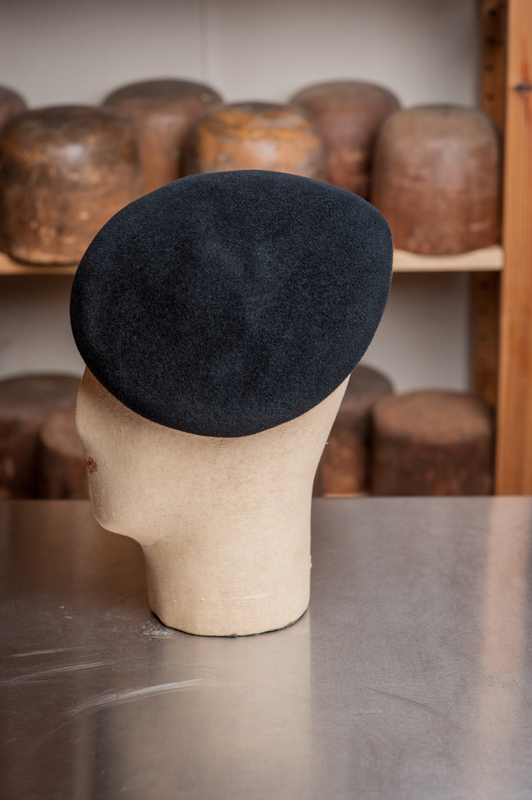 Belted Visor Cap in black velour style felt with vintage Bakelite buckle. 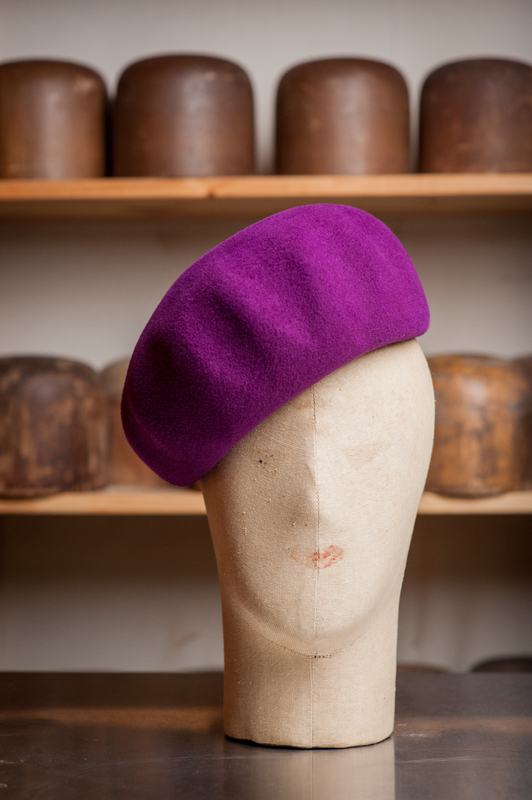 Groovy Visor in purple beaver style felt. May be worn as shown or hand shaped to suit. 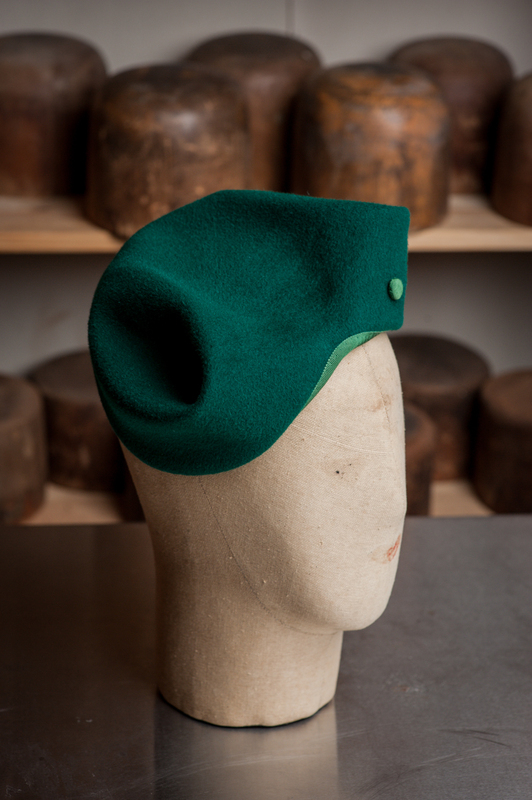 Visor Cap in army green beaver style felt with buckle trim. Toque with vintage double sided satin ribbon racing stripe trim. Top view with shape detail. 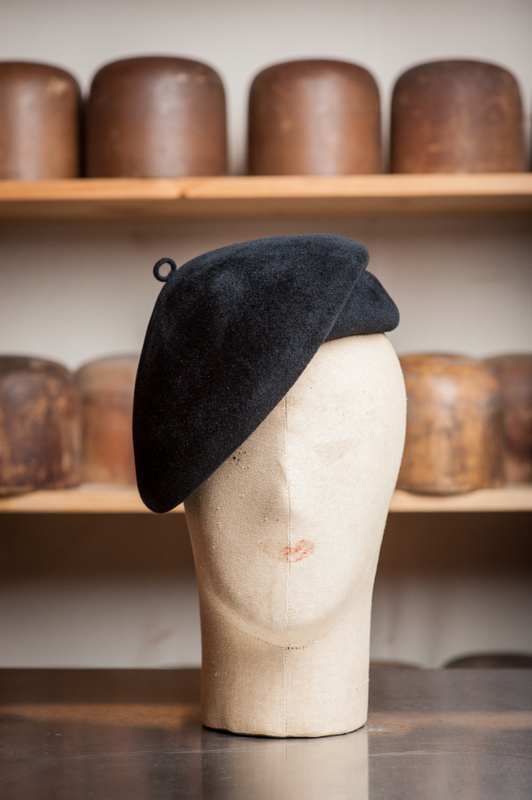 Three Cornered Beret in black velour style felt with ring accent. 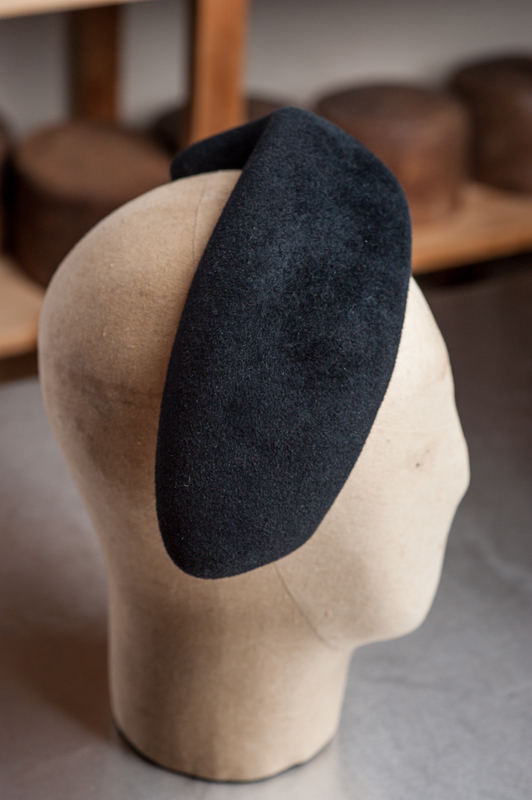 Black Visor in black velour style felt with bow trim. Visor Cap in burgundy with knotted trim. Groovy Belted Visor in orange with vintage Bakelite buckle. 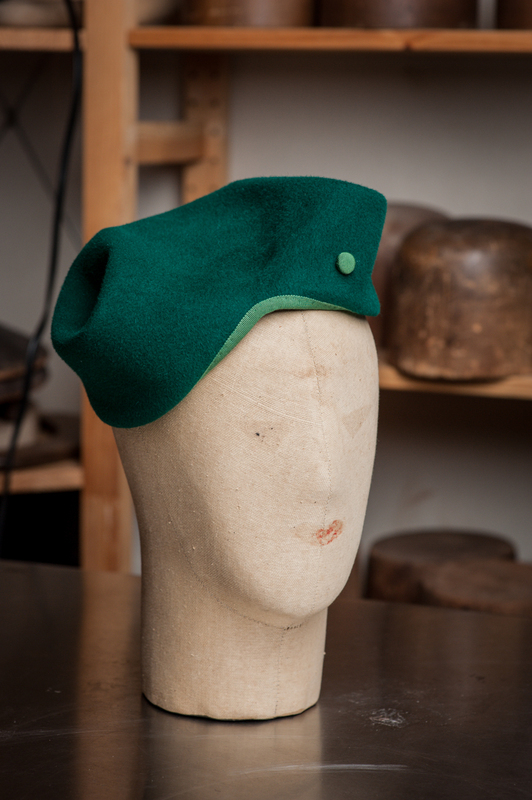 Bubble Visor in army green beaver style felt , velour brim, hand knotted trim and covered button accents. 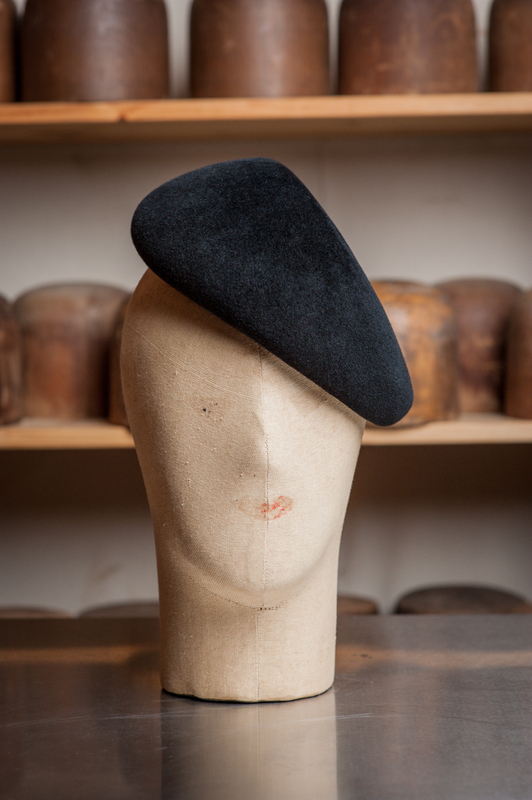 Groovy Mini Visor in black beaver style felt with velour brim. 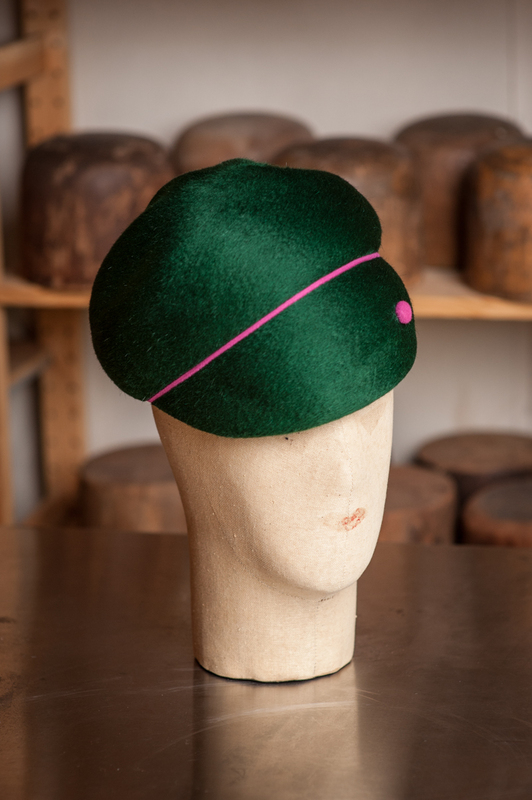 Groovy Watermelon Visor in emerald beaver style felt with pink accents. 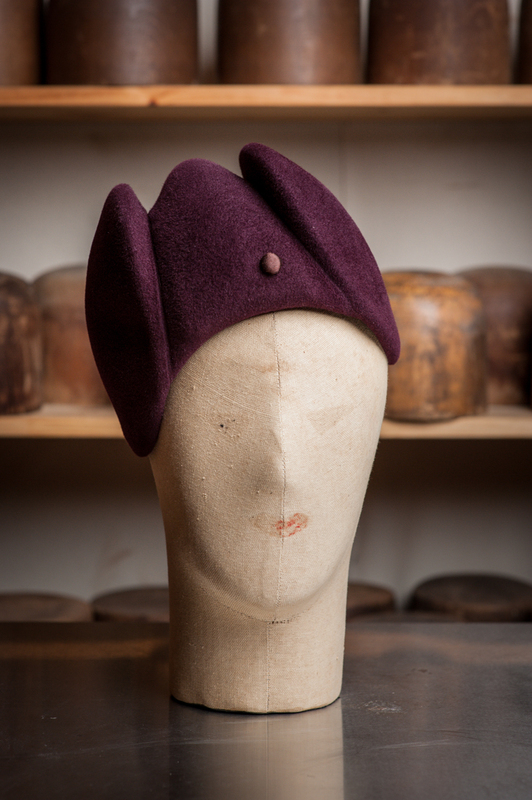 Classic Raspberry Beret. Also available in charcoal. 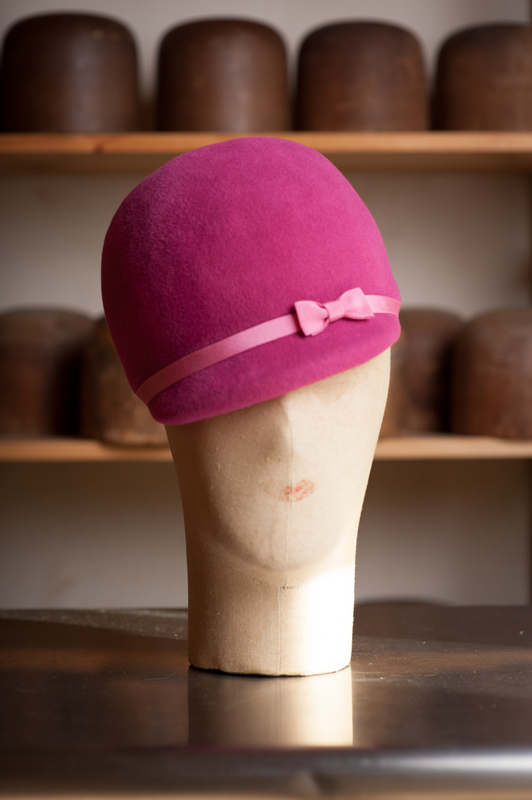 Pink Visor in velour style felt with bow. 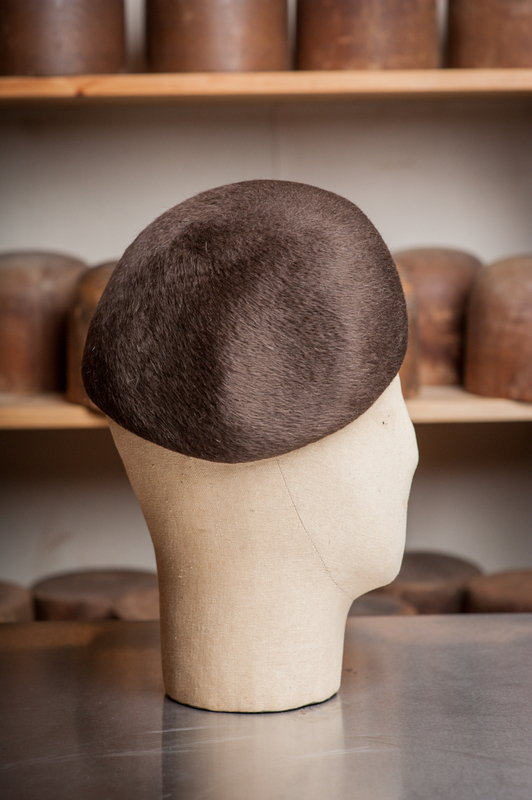 Eastern Toque in beaver style felt. 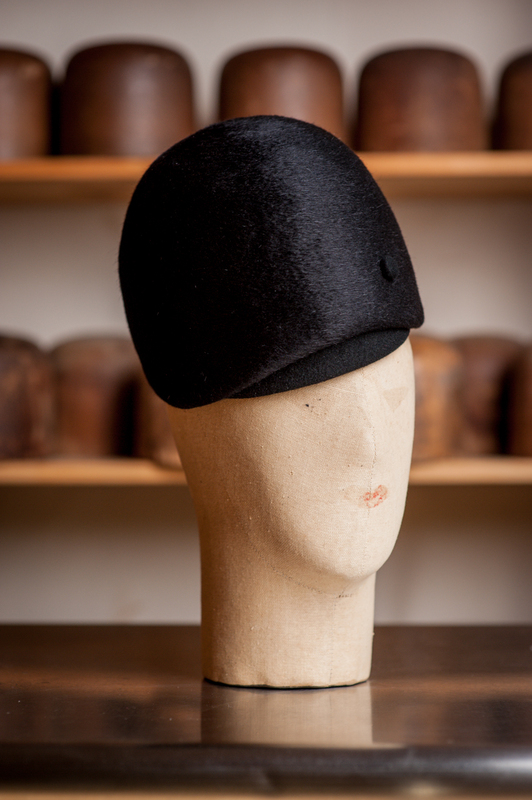 Charcoal Visor in beaver style felt with knotted trim. 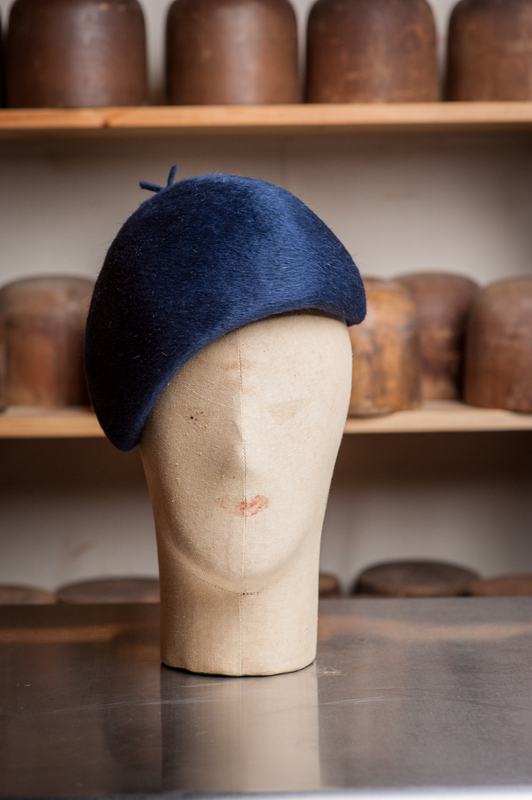 Three Cornered Beret in sapphire blue beaver style felt. 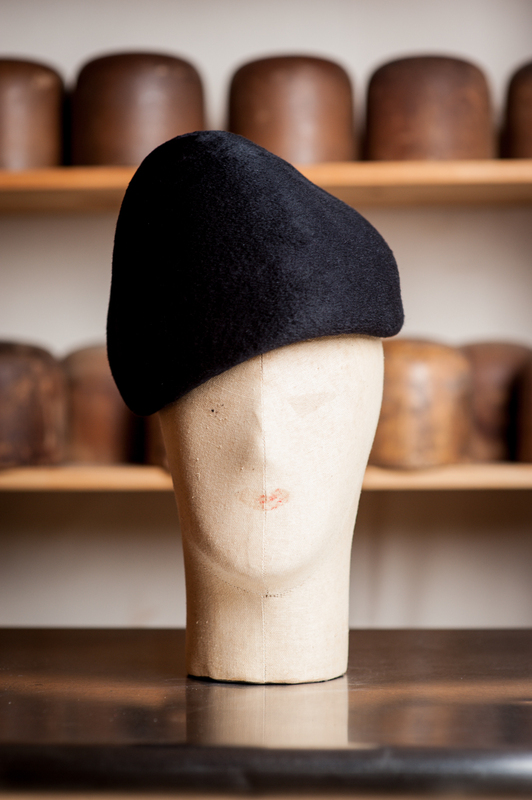 Black Geometric Beret/Perch in black velour. 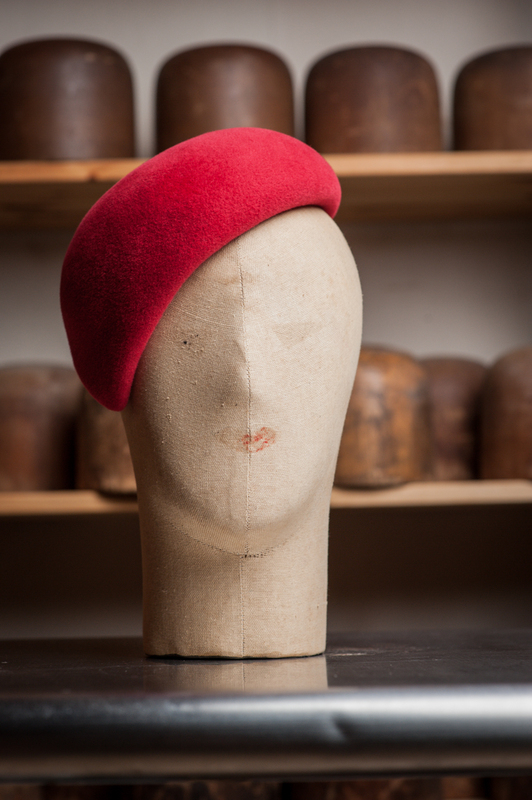 Beret with dramatic point shaped detail in red velour style felt. 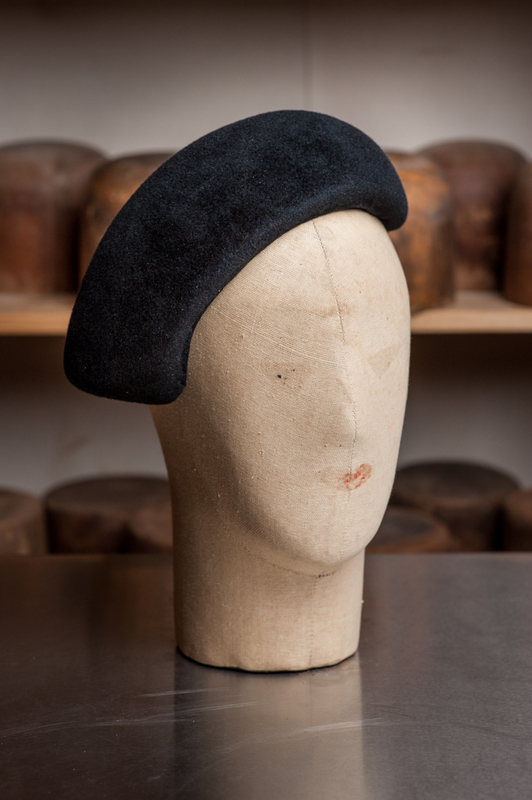 High Style Beret in black velour style felt with ring accent. 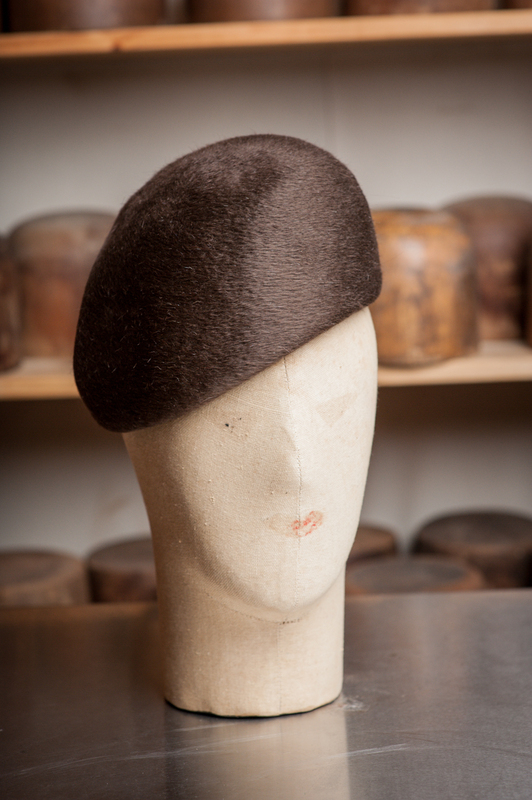 Classic Beret in chocolate beaver style felt. 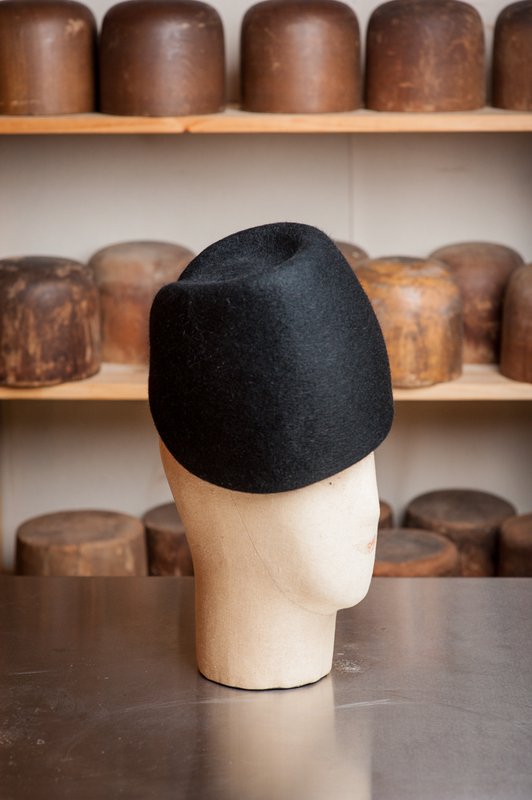 Cocktail Hat in black velour. 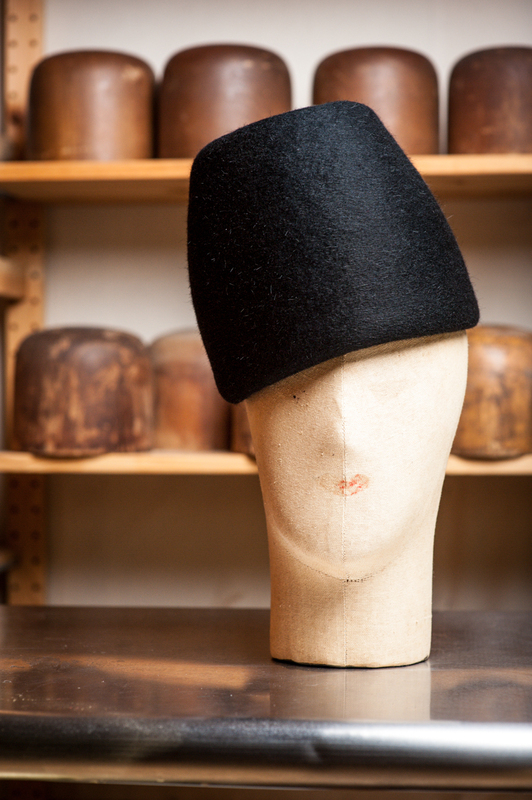 The Cocktail Hat is all about shape and style. The sky is the limit with these great hats that you can incorporate into a myriad of hairstyles. More New Hats For Fall! 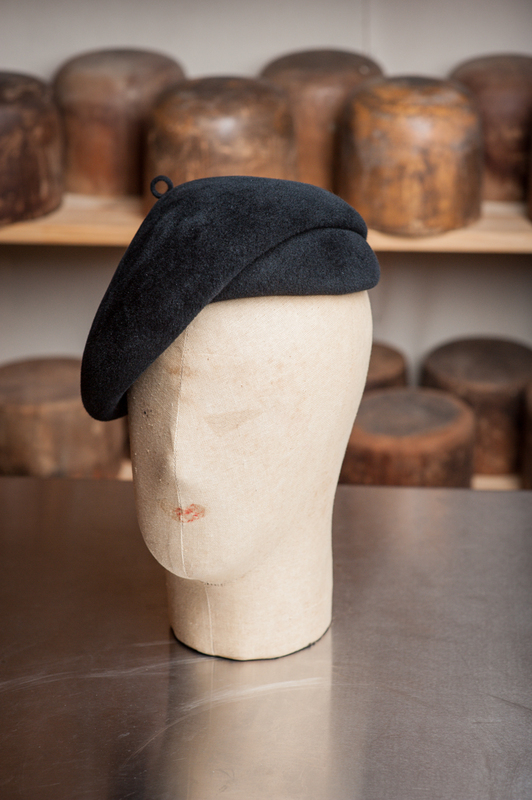 The beret has been a favorite among men and women forever. Easy to wear, they are adaptable and can be shaped and formed by the wearer to compliment any individual’s features. 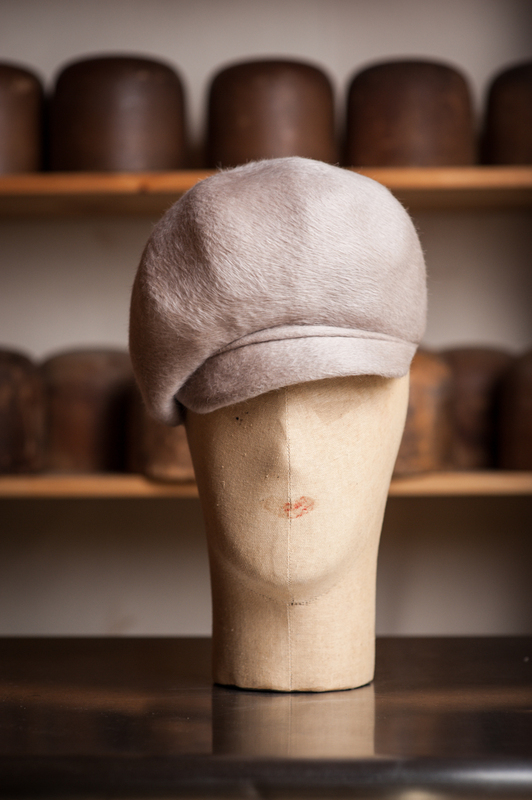 I have designed some variations on this classic hat, some with a more highly stylized appeal and some with a more relaxed look. 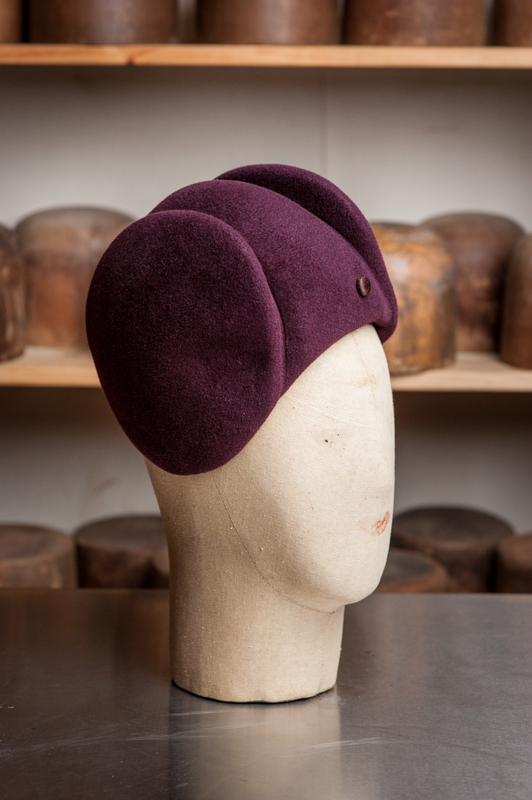 I like most milliners am inspired by shape. The last two hats in this post really catch the eye with their many changing angles, depending on the angle one wears it and if they are coming, or going. As promised, here are some new great new visors for fall. Check out my earlier posts for the rest of my visor line and my philosophy behind it.